Non-HID keyboards and mice can connect over multiple legacy buses but still use the same class driver. This section contains details on the class drivers themselves. The following sections goes into details on the controllers. This topic describes the typical physical configuration of keyboard and mouse devices in Microsoft Windows 2000 and later. The following figures show two common configurations that employ a single keyboard and a single mouse. The figure on the left shows a keyboard and a mouse connected to a system bus through independent controllers. A typical configuration consists of a PS/2-style keyboard operated through an i8042 controller, and a serial-style mouse operated through a serial port controller. Windows supports the simultaneous connection of more than one keyboard and mouse device. Windows does not support independent access by a client to each device. Kbdclass implements the Kbdclass service and its executable image is kbdclass.sys. Mouclass implements the Mouclass service and its executable image is mouclass.sys. Generic and hardware-independent operation of the device class. Plug and Play, power management, and Windows Management Instrumentation (WMI). Simultaneous operation of more than one device. Connection of a class service callback routine that a function driver uses to transfer data from the input data buffer of the device to the data buffer of the class driver. 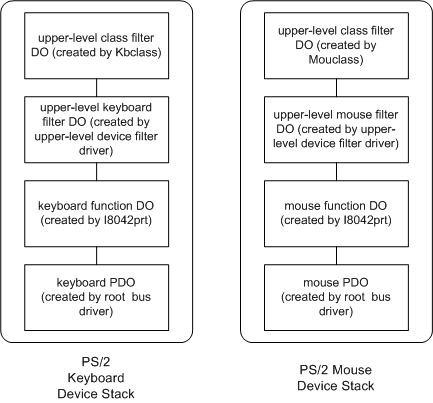 The following figure shows the configuration of device objects for a Plug and Play PS/2-style keyboard and mouse device. Each class driver creates an upper-level class filter device object (filter DO) that is attached to a function device object (FDO) through an optional upper-level device filter DO. An upper-level device filter driver creates the upper-level device filter DO. I8042prt creates the function DO and attaches it to a physical device object (PDO) created by the root bus driver. The keyboard driver stack consists of the following. The mouse driver stack consists of the following. Kbdclass and Mouclass can support more than one device in two different modes. In the one-to-one mode, each device has an independent device stack. The class driver creates and attaches an independent class DO to each device stack. Each device stack has its own control state and input buffer. The Microsoft Win32 subsystem accesses input from each device through a unique file object. The class driver creates both a grandmaster class DO that represents all of the devices and a subordinate class DO for each device. The class driver attaches a subordinate class DO to each device stack. Below the subordinate class DO, the device stack is same as that created in the one-to-one mode. The grandmaster class DO controls the operation of all the subordinate DOs. The Win32 subsystem accesses all device input through the file object that represents the grandmaster class device. All device input is buffered in the grandmaster's data queue. The grandmaster maintains a single global device state. Kbdclass and Mouclass operate in the one-to-one mode if their registry entry value ConnectMultiplePorts is set to 0x00 (under the key HKLM\Services\CurrentControlSet\<class service>\Parameters, where class service is Kbdclass or Mouclass). Otherwise Kbdclass and Mouclass operate in grandmaster mode. The Microsoft Win32 subsystem opens all keyboard and mouse devices for its exclusive use. For each device class, the Win32 subsystem treats input from all the devices as if the input came from a single input device. An application cannot request to receive input from only one particular device. The Win32 subsystem dynamically opens Plug and Play input devices after it receives notification from the Plug and Play manager that a GUID_CLASS_KEYBOARD or GUID_CLASS_MOUSE device interface is enabled. The Win32 subsystem closes Plug and Play devices after it receives notification that an opened interface is disabled. The Win32 subsystem also opens legacy devices by name (for example, "\Device\KeyboardLegacyClass0"). Note that once the Win32 subsystem successfully opens a legacy device, it cannot determine if the device is later physically removed. If the device is in the Plug and Play started state, the class driver sends the IRP_MJ_CREATE request down the driver stack. Otherwise the class driver completes the request without sending the request down the driver stack. The class driver sets the trusted file that has read access to the device. If there is a grandmaster device, the class driver sends a create request to all the ports that are associated with the subordinate class devices. The class driver sends an internal device control request to the port driver to enable the device. The class drivers must connect their class service to a device before the device can be opened. The class drivers connect their class service after they attach a class DO to a device stack. The function driver uses the class service callback to transfer input data from a device to the class data queue for the device. The function driver's ISR dispatch completion routine for a device calls the class service callback. Kbdclass provides the class service callback KeyboardClassServiceCallback, and Mouclass provides the class service callback MouseClassServiceCallback. A vendor can modify the operation of a class service callback by installing an upper-level filter driver for a device. The sample filter driver Kbfiltr defines the KbFilter_ServiceCallback callback, and the sample filter driver Moufiltr defines the MouFilter_ServiceCallback callback. The sample filter service callbacks can be configured to modify the input data that is transferred from the port input buffer for a device to the class data queue. For example, the filter service callback can delete, transform, or insert data. The class driver sends an internal device connect request down the device stack (IOCTL_INTERNAL_KEYBOARD_CONNECT or IOCTL_INTERNAL_MOUSE_CONNECT). The class connect data is specified by a CONNECT_DATA structure that includes a pointer to the class device object, and a pointer to the class service callback. After the filter driver receives the connect request, it saves a copy of the class connect data, and replaces the request's connect data with filter connect data. The filter connect data specifies a pointer to the filter device object and a pointer to the filter driver service callback. The filter driver then sends the filtered connect request to the function driver. The function driver uses the filter connect data to make the initial callback to the filter service callback. After filtering the input data, the filter service callback uses the class connect data that it saved to make a callback to the class service callback. For more information about all keyboard device control requests, see I8042prt Keyboard Internal Device Control Requests. In Microsoft Windows operating systems, PS/2-compatible scan codes provided by an input device are converted into virtual keys, which are propagated through the system in the form of Windows messages. If a device produces an incorrect scan code for a certain key, the wrong virtual key message will be sent. This can be fixed by writing a filter driver that analyzes the scan codes generated by firmware and modifies the incorrect scan code to one understood by the system. However, this is a tedious process and can sometimes lead to severe problems, if errors exist in the kernel-level filter driver. Note There is also a Keyboard Layouts key (notice the plural form) under the Control key, but that key should not be modified. In the Keyboard Layout key, the Scancode Map value must be added. This value is of type REG_BINARY (little Endian format) and has the data format specified in the following table. The first and second DWORDS store header information and should be set to all zeroes for the current version of the Scan Code Mapper. The third DWORD entry holds a count of the total number of mappings that follow, including the null terminating mapping. The minimum count would therefore be 1 (no mappings specified). The individual mappings follow the header. Each mapping is one DWORD in length and is divided into two WORD length fields. Each WORD field stores the scan code for a key to be mapped. Once the map is stored in the registry, the system must be rebooted for the mappings to take effect. Note that if the mapping of a scan code is necessary on a keypress, the step is performed in user mode just before the scan code is converted to a virtual key. Doing this conversion in user mode can present certain limitations, such as mapping not working correctly when running under Terminal Services. To remove these mappings, remove the Scancode Map registry value and reboot. The following table contains these entries broken into DWORD fields and the bytes swapped. 0xE01D0000 Remove the right CTRL key (0xE01D --> 0x00). 0xE038E020 Right ALT key --> Mute key (0xE038 --> 0xE020). After the necessary data is generated, it can be inserted into the registry in several ways. A .reg file can be generated that can be easily incorporated into the system registry using a registry editor. An .inf file can also be created with an [AddReg] section that contains the registry information to be added. Regedt32.exe can be used to manually add the information to the registry. The Scan Code Mapper has several advantages and disadvantages. The Mapper can be used as an easy fix to correct firmware errors. Frequently used keys can be added to the keyboard by modifying the map in registry. Keys that aren't often used (for example, right CTRL key) can be mapped to null (removed) or exchanged for other keys. Once the map is stored in the registry, a system reboot is required to activate it. The mappings stored in the registry work at system level and apply to all users. These mappings cannot be set to work differently depending on the current user. The current implementation restricts the functionality of the map such that mappings always apply to all keyboards connected to the system. It is not currently possible to create a map on a per-keyboard basis. For more information about all mouse device control requests, see I8042prt Mouse Internal Device Control Requests. The following is a list of registry keys associated with the mouse class driver. MaximumPortsServiced – Not used on Windows XP and later. Only for Windows NT4. ConnectMultiplePorts – Determines whether there is one or more than one port device object for each class device object. This entry is used primarily by device drivers. MouseDataQueueSize - Specifies the number of mouse events buffered by the mouse driver. It also is used in calculating the size of the mouse driver's internal buffer in the nonpaged memory pool. Creates the MOUSE_INPUT_DATA structures required by MouseClassServiceCallback. Transfers MOUSE_INPUT_DATA structures to the Mouclass data queue by calling MouseClassServiceCallback in its ISR dispatch completion routine. The driver sets the MOUSE_MOVE_ABSOLUTE flag in Flags. If the input should be mapped by Window Manager to an entire virtual desktop, the driver sets the MOUSE_VIRTUAL_DESKTOP flag in Flags. If the MOUSE_VIRTUAL_DESKTOP flag is not set, Window Manager maps the input to only the primary monitor. Mouhid, the Windows function driver for HID mouse devices, implements these special requirements automatically. An upper-level filter driver is required. The filter driver supplies an IsrHook callback and a class service callback. I8042prt calls the IsrHook to handle raw device input, and calls the filter class service callback to filter the input. The filter class service callback, in turn, calls MouseClassServiceCallback. The combination of the IsrHook callback and the class service callback handles device-specific input, creates the required MOUSE_INPUT_DATA structures, scales the device input data, and sets the MOUSE_MOVE_ABSOLUTE flag. A Plug and Play function driver is required. The function driver creates the required MOUSE_INPUT_DATA structures, scales the device input data, and sets the MOUSE_MOVE_ABSOLUTE flag before it calls MouseClassServiceCallback. A device-specific function driver is required. The function driver creates the required MOUSE_INPUT_DATA structures, scales the device input data, and sets the MOUSE_MOVE_ABSOLUTE flag before it calls MouseClassServiceCallback.